Have your flip-flops handy for infinity pools, sundown cocktails and serene yoga platforms, all conjuring up a vision of Filipino-flavoured escapism. Adventure is on the menu too, as we quad bike over the iconic Chocolate Hills and paddle-board down Loboc River. This is a whirlwind foray of Manila bike rides, island sea kayaking and star-gazing on remote powdery beaches. Several pools, including a huge infinity pool with views of Alona Beach, and Amorita’s private beach, where you’ll see few people but lots of colourful marine life. Touch down in Manila, the gateway to the 7000 islands of the Philippines, and the starting point of your tropical adventure. Please arrive at the airport before 4pm, where your private transfer will whisk you to your boutique hotel. Check in and freshen up in this hipster oasis before embracing the madness of Manila. Get ready to tuck into tasty local dishes and explore the lively streets of the capital. Get to know your fellow Flashpackers as you discover its dynamic mixture of old and new, from gleaming high-rises to beautiful Spanish architecture. Power on to the pulsating clubs and rooftop bars (if your jetlag can hack it), or retreat back to the sanctuary of your peaceful hotel. This is only the beginning! Here at Flash Pack, we don’t like to do things the ordinary way. So this morning we’re heading to the walled city of Intramuros, but forget your standard walkabout – we’ll be cruising through the historic streets by bamboo bikes. Handmade by Gawad Kalinga villagers, these quirky bikes are a really great way to contribute to ecotourism whilst covering more ground. After you’ve pedalled your way through the ancient ruins of this historic walled neighbourhood and soaked in its rich architectural heritage, dig into lunch at a local restaurant. Then it’s time to unwind by the turquoise hotel pool at your midcentury hotel. Knock back sundowners with your fellow Flashpackers – what a blissful end to your second day. 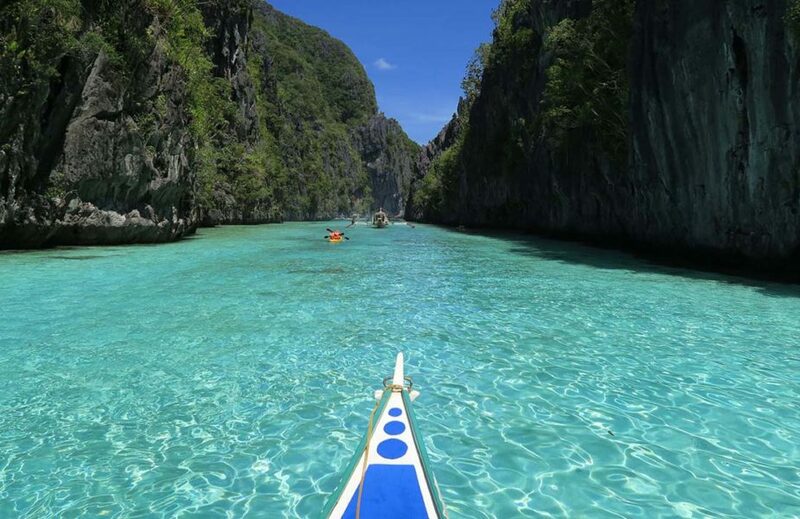 After breakfast at your hotel, bid farewell to the vibrant capital and hop on a 70-minute flight to El Nido. This town lies on insanely picturesque Palawan, regularly voted the Best Island in the World by travel magazines. With its pristine white beaches, deep turquoise ocean and lush rainforest, it’s not hard to see why. Prepare for your Instagram to creak under an influx of snaps of the emerald-green seascape and a series of picturesque fishing villages, along with beaches dotted with colourful paraw boats. After checking into your hotel, take a stroll to the beach to get a feel for small and laid-back El Nido. In the evening, we recommend a graceful flop into the pool, for glorious views of Bacuit Bay and its green-shrouded karsts at sundown. Wake up to the sound of the sea lapping on the shore, your powdery beach paradise stretching out before you. Today, the island-hopping dream continues aboard your private boat, all stocked with snorkelling gear, sea kayaks and a picnic lunch to tuck into on any island of your choice. In this turquoise playground, you can admire shoals of tropical fish in the rich marine world, paddle between hidden coves or swim to the shore for fresh coconuts. All this fresh air and sunshine is thirsty work, so dig into our supply of ice-cold beers as a refreshing refuel. Come twilight, dock up once more on your secret beach, for another delicious barbecue as the sun fades to moonlight. Sometimes, all you need in life is to be marooned on a picture-perfect desert island, far from the cry of civilisation (well, apart from the personal chef, of course). Today is a day of freedom to do exactly as you please. This is your chance to live your best beach life in the sun-soaked straits of El Nido. We suggest more snorkelling (take advantage of the clearest waters known to mankind) or flexing your beach volleyball skills with your Flashpacker team at the ready. You might also want to join locally-run kayak expeditions to nearby lagoons. Cathedral caves, with their majestic tall ceilings, are another highlight on El Nido. If you’re feeling particularly active, you could hike to the top of Taraw Peak for sweeping views of Bacuit Bay, or clamber through the jungle to the Nagkalit-kalit Falls. Then again, you can always simply sprawl out on one of the many glorious beaches with a beer and a captivating book for company. In the evening, refamiliarise yourself with a string of laid-back beach bars, your Flash Pack pals in tow. Today we’ll catch a 90-minute flight to Cebu and a two-hour ferry to Bohol’s Panglao island, another in the Philippines’ chorus line of enchanting hideaways. Be sure to pack well for all this island-hopping; we’re talking great reads, cards and top-notch tunes. A treasure trove of powdery beaches, lush forest and symmetrical hills, Panglao is a beauty – welcome to your sublime home for the next four nights. You’ll find your stunning hotel on the south of the island, right by the shimmering Bohol sea. Wallow in pristine pools, or settle in for some well-deserved pampering. There’s also a marine sanctuary that you can snorkel around off a nearby beach cove. After a tough day travelling, take advantage of the island’s effusive bars on Alona Beach (think easygoing beach crowds and guest DJs) to party the night away by the ocean waves. Flashpackers, get set for another day of the Great Unknown. Today, we’re whisking you off to Loboc River, an emerald-green waterway that snakes through the wild interior of Bohol island. Tucked away from the tourists, get to know this serene and magical landscape with a spot of stand-up paddle boarding. Splash your way through a remote world of jungle river banks and tiny villages, with waterfalls here and there. The unspoiled canvas of lush greens and abundant wildlife will have you feeling like you’ve stepped into Jurassic Park (minus the dinosaurs). Take time to unplug and reflect in the dense palm-frond terrain. If time is on our side, we’ll also pay a quick visit to the centuries-old Baclayon Church, made from coral stone cut from the sea. Once we’ve floated for a good few hours, we’ll head back to Panglao island for lunch. Spend the afternoon soaking up some rays, snorkelling or doing whatever else your beach-side self desires. You’re getting good at this now. The time has come to leave your sun-addled pocket of paradise. But before you sob into your morning smoothie, think of all the amazing experiences you’re going home with. You’ve cruised through the capital on bamboo bikes, stayed on the Best Island in the World and glamped out on a secret beach. You’ve snorkelled through coral reefs, quad-biked across the legendary Chocolate Hills and gone paddle-boarding down a remote jungle river. You’ve had your fill of sizzling beach barbeques, street food and sundowners. You’ve wallowed in turquoise seas and infinity pools, fuelling your soul with shady hammocks and tropical sunsets. And you’ve hung out in a string of decadent beach hotels, bonding with a brand new crew of solo travellers along the way. It’s been one island-hopping whirlwind of pure, sun-kissed escapism. So, return home a glowing version of your former self. Or, you could just paddle away into the fiery sunset – and who would blame you? Travelling to the Philippines is not for everyone. This adventure involves a remote island location where there is no mobile connection, basic facilities and we camp out on the beach. We love it there and it’s a great chance to unplug, but it won’t suit travellers with expectations of luxury.